anyone else going to be there at that time? I'm always there, whether I am actually there in body or not, I'm always there in spirit. If you are in the park now, where are you getting internet access? He's not, if this is really happening. So, to take it on a 360 tour (no pun intended)....again, why do you love it so much? I LUV BIG BEND BECAUSE I AM PART OF IT AND IT IS PART OF ME AND I BELONG THERE FOREVER! I love Big Bend because I was COMPLETELY taken by surprise. The first trip I took was early July 2002 with my 15yr old daughter. We stayed eight days, camping in the Basin. We spent two strategically spaced nights in the Indian Lodge at Fort Davis.... to get a bath, let her call her boyfriend, etc. That was (and still is) the best vacation I have taken. The picture above is in August 2003 when we went back. That was great bonding time for us and will always be special. I think the century plants and sotols were the most memorable. All of the landscape and plants seemed very different. I fell in love. 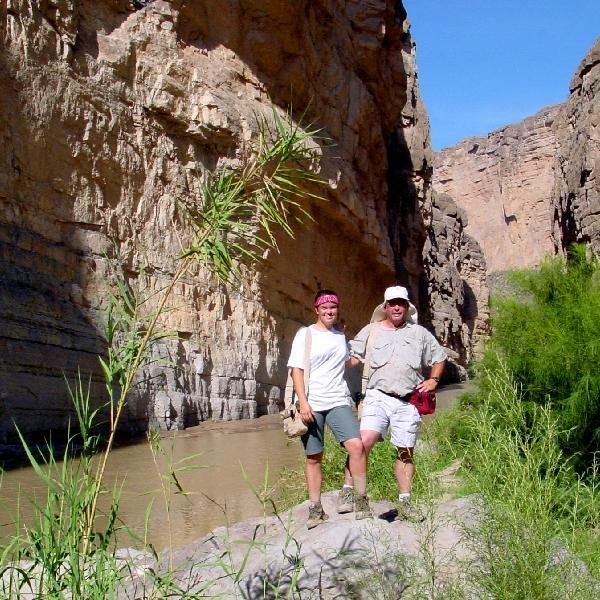 I have also mentioned to family members that I would like my ashes scattered in Big Bend. yeah, and I loved the Tuff Canyon 360. I have been looking at your website for a long time before I got on here. I like them all. that's cool, i'm glad you enjoy them! Here is my answer to "What's The Big Deal?" ... and click on the "The Big Bend" button in the bottom left of the opening screen. This took 4 minutes to load and the "video" is 5 minutes long. The transitions are rough and the picture quality is spotty, but this is the only way I know how to share this. The music is from Govi. It is a CD I bought when I was in Galveston.